I'm all for back-to-basics. I mean, why make things more complex than they need be? 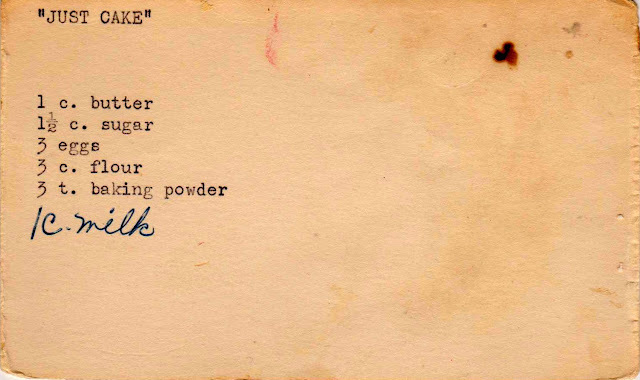 And so it was great delight that I came upon this recipe labeled: "Just Cake." Though it read more like a shopping list than an actual recipe, I took the plunge. 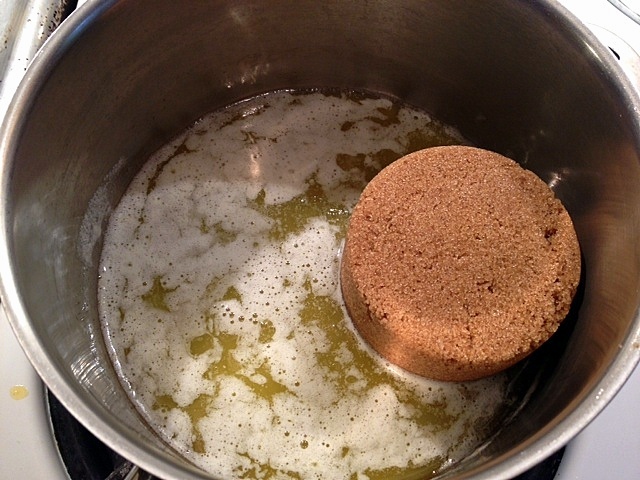 using an offset spatula (preferred) or the back of a spoon or regular spatula, smooth the batter until it reaches the edge of the pan. Place in the center of the oven and bake for 25 to 30 minutes. 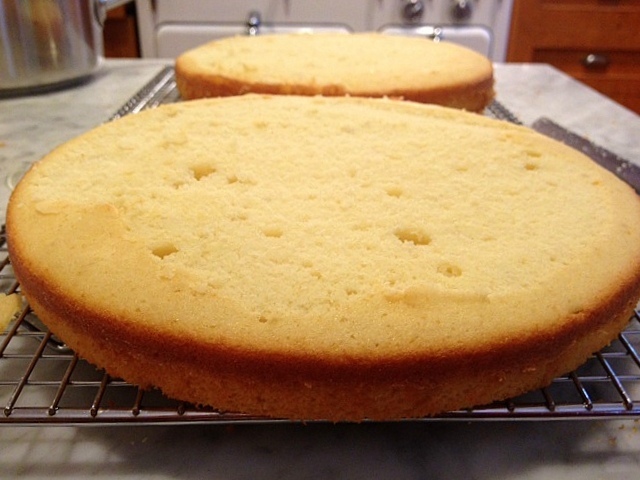 When the cakes are cool, turn them out from the pan. If they have a small dome on top, place a serrated knife horizontally and cut the tops off so the cake top is flat and even. The cook must eat the trimmings. I believe it's the law. 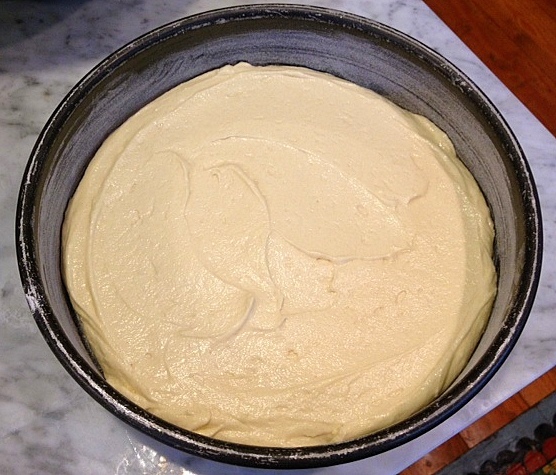 Next, begin the caramel frosting. Melt the butter and add the brown sugar. Cook for two minutes, then add the milk. Let cool and add some confectioners sugar. Original recipe below, and below that, is my interpretation. Mix flour, salt and baking powder; set aside. Beat butter. Beat in sugar until light and fluffy. Add eggs, one at a time. 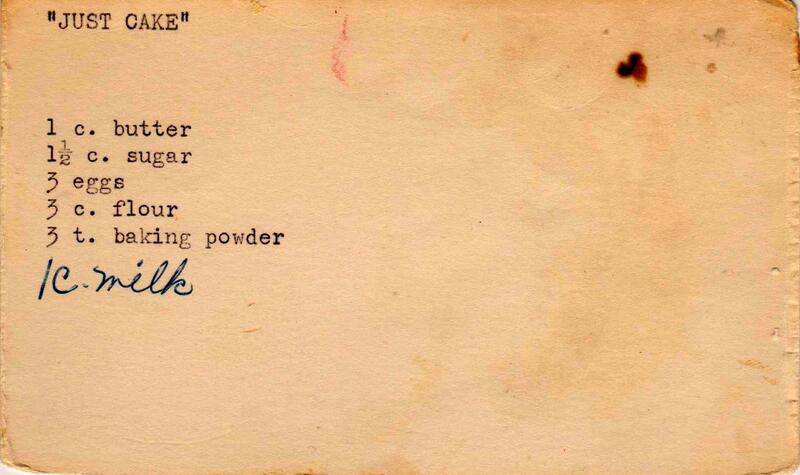 Add 1/3 of the flour and blend. 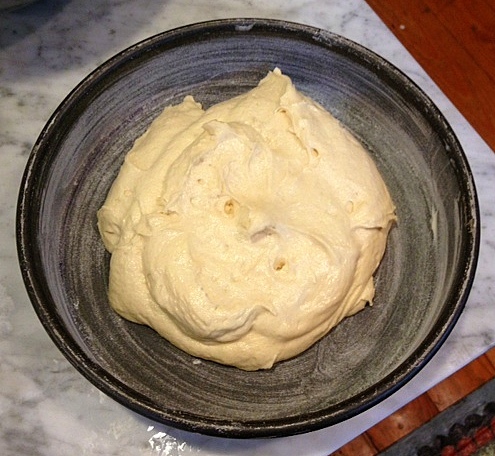 Alternately add the milk and flour, ending with the flour. Add vanilla. Pour into pan and bake about 25 to 30 minutes. Cool about ten minutes and remove from pan. I followed the frosting recipe exactly, but at the end added more milk and confectioners sugar to ensure I had enough to frost the cake. My mouth watered as I read this post. 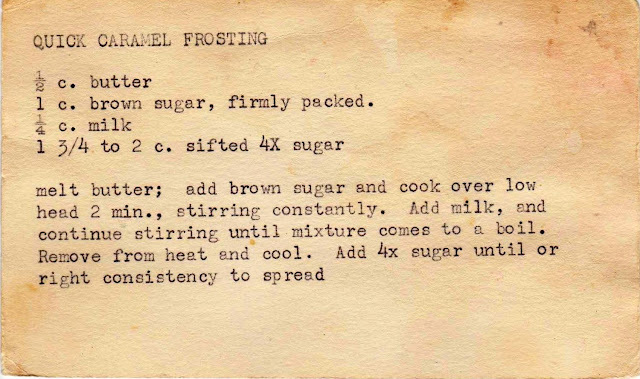 I've been searching for the perfect caramel frosting (remembered from childhood), and I suspect this might be it. I hope it is your perfect frosting! Just made the recipe and it turned out perfect. LOVE the frosting as well. A note: your cake recipe doesn't mention the sugar in the preparation steps. I assumed it was to cream the butter and sugar together (not much of a stretch there). Sure have enjoyed your recipes....now everyone is asking, "What's next?" Charles - Thanks so much. Especially for pointing out that I had forgotten the sugar instruction! It has been corrected. I'm so sorry it didn't work out for you -- with three eggs, two sticks of butter and one cup of milk there should have been plenty of moisture in the batter. But I feel for you re: the wasted butter and sugar. Hi, would like to make this for a 90th birthday... it may be obvious but what's '4x sugar'? Do you mean sifted four times? And is that icing sugar? Thanks! It's not obvious at all, so thanks for asking. 4X sugar is confectioner's sugar (or at least that's what I used for this frosting!). Also, you may want to double the frosting recipe (or increase it by 1/2) to ensure you have enough to cover the cake. 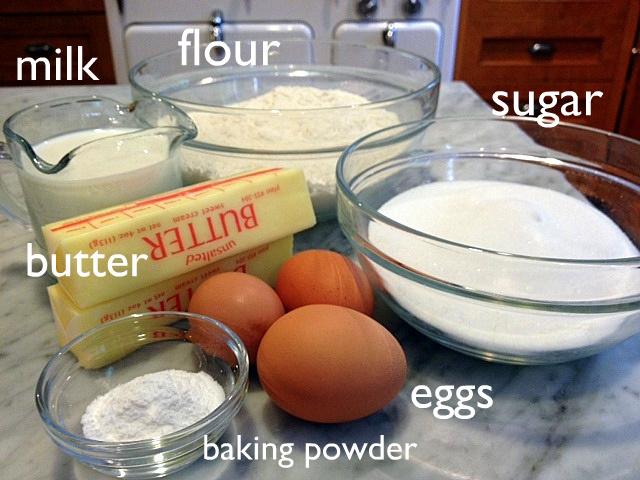 I randomly increased the amount of some of the ingredients while I was making the frosting, because I didn't think there would be enough, but since you're making it for an occasion, better to more closely follow the recipe. Good luck! hi Susan, what a great blog!!! i'm interested in this 4x sugar....i've heard powdered sugar called 10x sugar before. one of the chefs i worked for explained to me that it is the ratio of sugar and cornstarch... 10 to 1....i wonder if that has changed over the years from 4 to 10?? very interesting! Hi Betsy -- Although oddly written, I think it means to sift the powdered sugar four times. But who knows for sure?!? That's just another name for castor sugar "4X". it doesn't mean "4 times" the sugar. Hi, thanks for this recipe. How long should I allow the mixture to cool before adding the 4x sugar? Just until it's cool to the touch, is all. Hi- what kind of milk did you use for the frosting? I always use whole milk, but if I don't have it on hand, I mix half & half with skim (because I always have those two in the house). 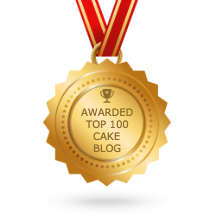 Although I've had you forever on my 'Crazy Stable' blogroll, I hadn't checked in in ages, and was doing some blogroll housekeeping, and was simply delighted to find you still in business turning out lovely cakes and lovely (funny, honest) prose. "Cook must eat the trimmings"....oh yes! Nom nom cake-domes! I spend way too much time on FB now but will post a nudge there for people to check you out. 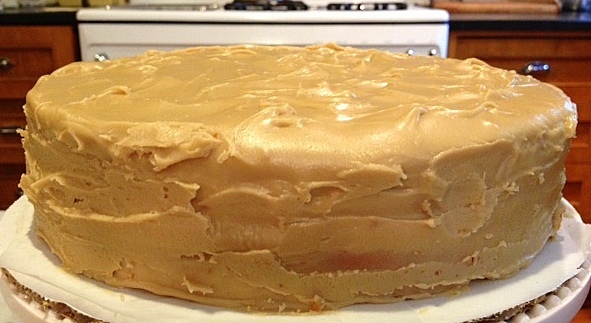 Have never found a Caramel Icing I really liked and this one turned out great. 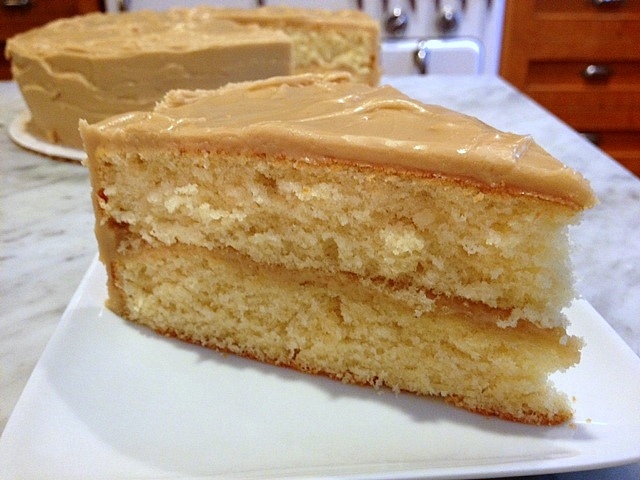 i have been baking for a Church Festival and did 2 sheet cakes a spiced one with this caramel icing on it and know it will be a hit. am thinking I want to try it instead of chocolate icing on my brownies put the caramel on them. Nothing better than chocolate and caramel. may do that this next week for company . thanks for sharing the recipe . will definitely try the caramel frosting .